One of the things most writers want to know is how much time they’re spending on writing a piece of text. 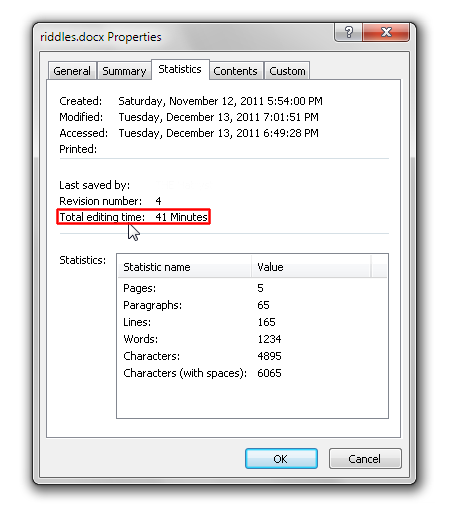 If you use Microsoft Word for all your writing needs, you’re in luck, because it is really easy to find out the time consumed on the editing of a Word document. When you start working on a new Word document, a timer starts, and once you save the document, the time consumed thus far is saved as the ‘total editing time’. You continue to work on the document, and save it again, and the time elapsed since the last save is added to the total editing time. However, if you exit without saving the document, the time since the last save won’t be added to the total time. 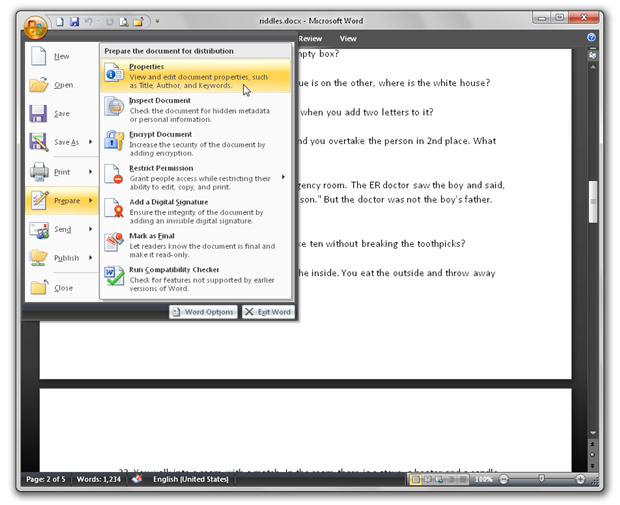 In our testing, this feature was found to be present in Office ’03, 07’, and ‘10. So when you’re working on the document and want to check the total time consumed so far (since the beginning), click the Office logo, navigate to Prepare, and click Properties. In the properties pane, click Document Properties>Advanced Properties. the Statistics tab, and have a look at the updated Total Editing Time. If you’re on Office ’10, click the File tab, navigate to Info, and under the Properties section, you can find the Total Editing Time field. It shows the time passed since the beginning of the document till now, and it also includes the time since the last save, so if you exit without saving, the document properties will show the time till the last save. 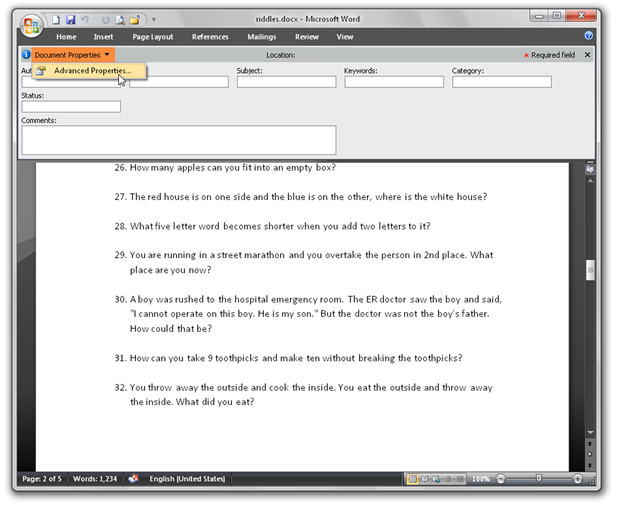 You can try this with your existing MS Word documents as well. 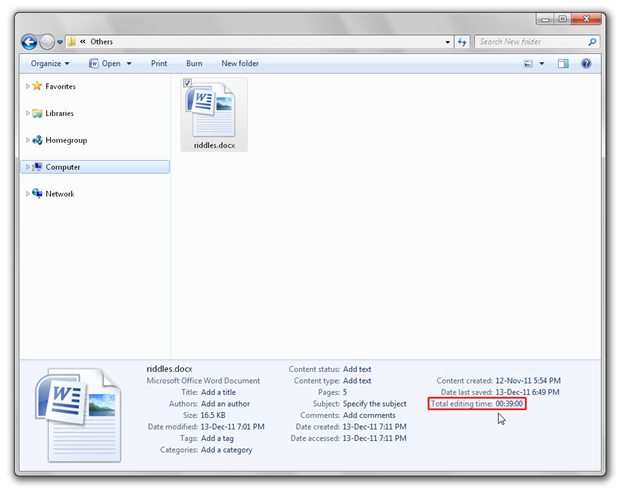 Make sure the document is not open, navigate to the location where it is saved, and click it. You’ll see some details and statistics in the details pane. Have a look at the ‘Total Editing Time’ field. The time format is H:M:S, but it doesn’t count seconds, so all you get is the total editing time in hours and minutes. In this case, it’s 0 hours and 39 minutes. 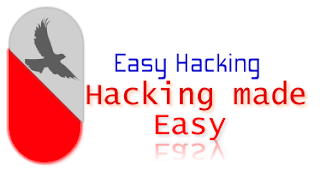 You can check this by another method as well. Right click the document, click Properties, click the Details tab, and find the Total Editing Time field. It is worth mentioning that some problems are associated with this. Sometimes, Word continues running the timer in the background even if you’re working on something other than the document (that’s my case, others may vary). Another problem is that this feature does not work in Germany (and a couple of other regions), and you’ll see 0 minutes as the total editing time. And here’s the good news. As the title states, this works for MS PowerPoint as well, just follow all these steps for PowerPoint, and you can see the total time you’ve worked on a presentation. Share your interesting editing times in the comments!